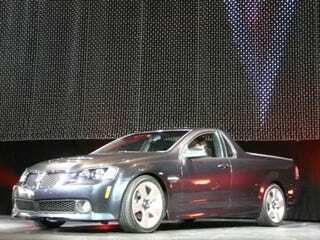 2010 Pontiac G8 El Camino, Revealed Live! We had a caminogasm over the weekend when we dropped pics and press on the 2010 Pontiac G8 ST — which we're sure you'll vote to call the El Camino — and now we can give you the whole enchilada. The baddest truck-car bound for America just bowed here at the 2008 New York Auto Show and the explosion of flashbulbs has our heads spinning. The most anticipated car here at the show is a freakin' superstar on the stage and we're swarming it to learn all the important parts we didn't know before - like just what kind of toting capacity that bed has. Stay tuned for a bevy of live pics and far more geeking out.